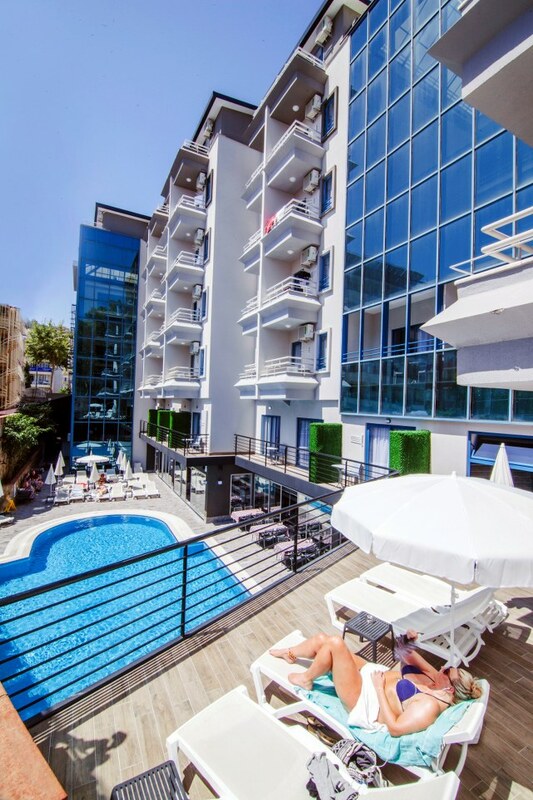 The Ramira City Hotel is located in city center of Alanya, approx. 600 m. to famous Kleopatra Beach (free shuttle service and free parasol & mattresses on the beach). Only 500 m. to harbor which is the center of entertainment, the discothèques & bars. There is a reception, lobby, buffet restaurant, Pool Bar, a swimming pool, Sauna & massage room, table-tennis at pool area, meeting room and a fitness center. The pleasant, modern -furnished rooms are equipped with WC, shower, hairdryer, Laptop safe, individually adjustable air-conditioning, flat screen TV, telephone, kettle and a mini-bar. Beach Towels in Hotel room at Arrival. 76 rooms for 2 or 3 persons including 1 French, 1 single bed; 8 rooms for 2 persons including 1 French bed. Each room has a balcony with coffee table and chairs. Entertainments - night life near around.